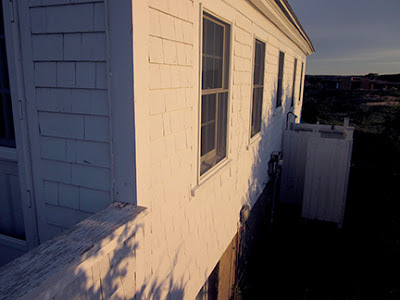 Here are some of the new photos of the S. Truro, MA Hopper studio that have been posted to the special Hopper Studio Photos page of my website. The page will be getting additions regularly over the next period as we have a lot of great new photos to download. I believe it is the largest group of original photos of the Hopper studio to be found anywhere and can serve as a resource for Hopper scholars and Hopper lovers. Above is a view through the open kitchen door- this is the entryway the Hoppers used to get to their car and the outside world. This is the southeast corner of the studio, with the far window opening onto their small bedroom. 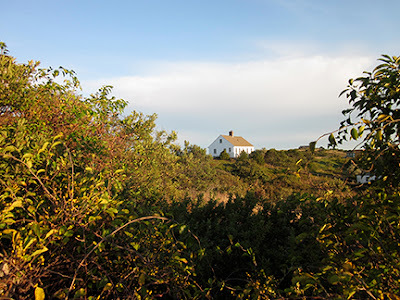 Usually there is quite a breeze blowing in off Cape Cod Bay as the studio is at the crest of a steep hill. The present owner of the studio had a partly sheltered set of steps with waist high walls added a few years ago as a buffer against the elements. This is standing in the painting room looking due south, toward the fireplace. At left behind the bookcase are some extremely steep stairs leading to the basement, and in the distance the kitchen we saw in the above photo. 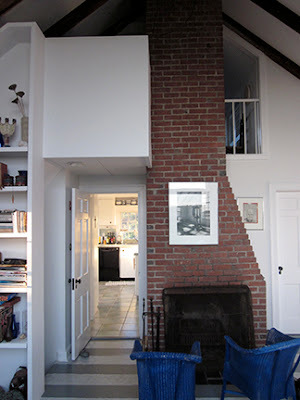 The bookcase and the upper level was modernized after Hopper was gone. In his day it was pretty unfinished and used more for just storage. When we first went there in 1983 we found up in the attic two dusty sets of wooden stretcher bars where Hopper had stretched watercolor paper tight over them. They seemed to be waiting patiently for Hopper to pick them up and start new paintings. I was very moved to discover them there. This is the east wall of the studio catching the first rays of sun. There is an old outdoor shower partly hidden in the shadows. I'm not sure if it was there in Hopper's time or if it came later. 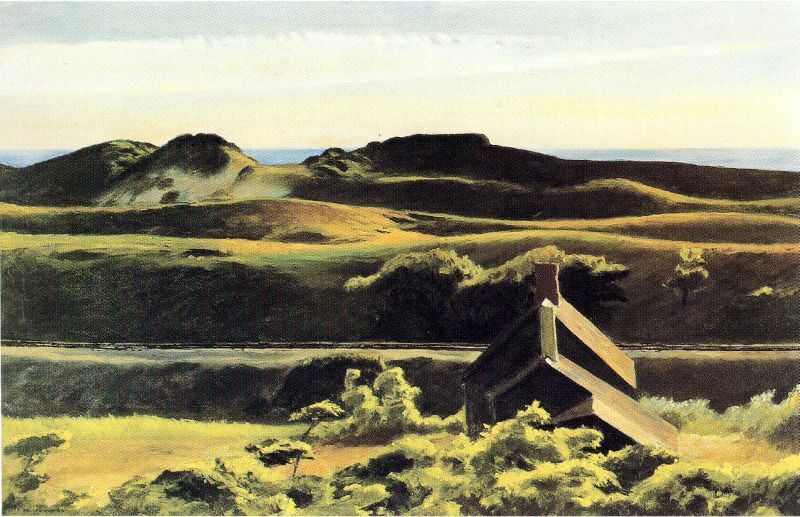 The shadow from the bushes is new, as in Hopper's day they had yet to re-grow to any height ( the 19th century's hunger for fuel and lumber pretty much denuded the Cape, and even in the 1930's when the studio was built the hillsides were mostly just sands and grasses). Now the short sea-challenged trees are making a comeback. This is the view from about 3/4 of the way down the winding path Hopper would take to get from his studio to the shore on Cape Cod Bay. It's looking to the southwest. 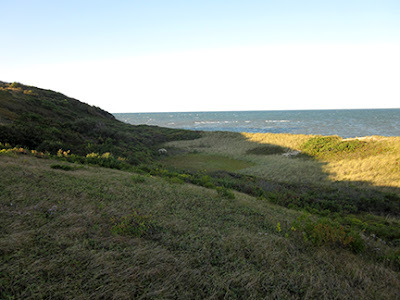 The wind is usually whipping through the low plants and grasses on the dunes creating this moving or undulating effect. It's often extremely stirring. This is the studio viewed from the south from the neighbor's driveway. Here is one of my vine charcoal drawings I did with my French easel set up in Hopper's bedroom. It is Hopper's Truro Bedroom III, 7 x 14", 2012. 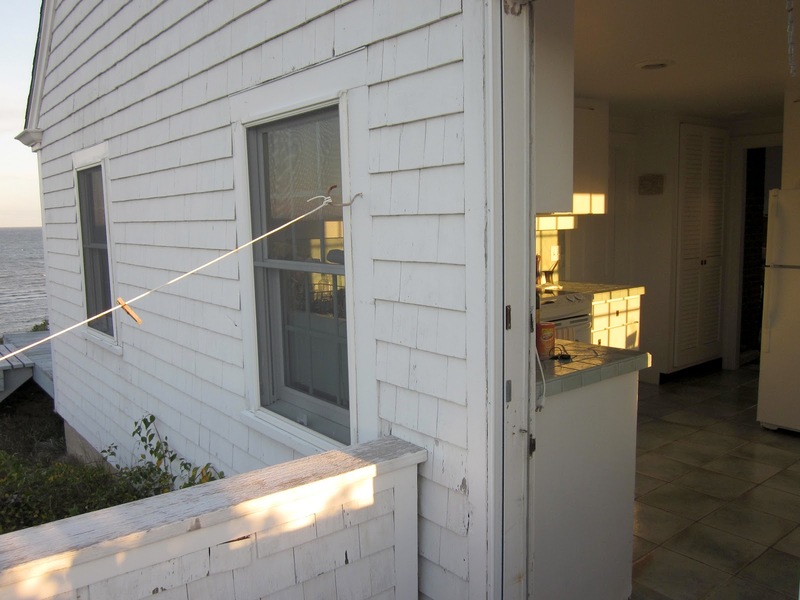 The left window looks out onto the water of Cape Cod Bay, the first door is to one of the two small closets in the bedroom, and the large doorway opens out to Hopper's painting room. 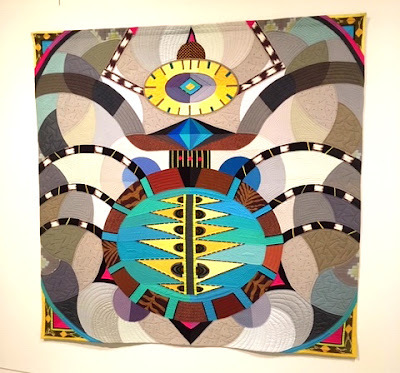 On a totally different note, the Delaware Art Museum just opening their Centennial Juried Exhibition Friday evening. I had one of the pieces selected display, The Song of all Days, oil on panel, 36 x 72". 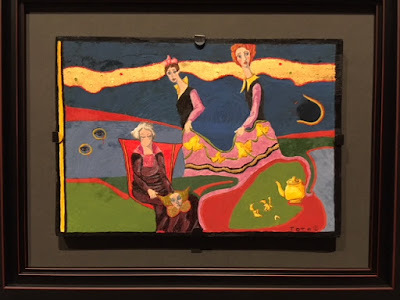 Had a chance to chat with the juror for the exhibit, John Ravenal, the contemporary curator at the Virginia Museum of Fine Art in Richmond. 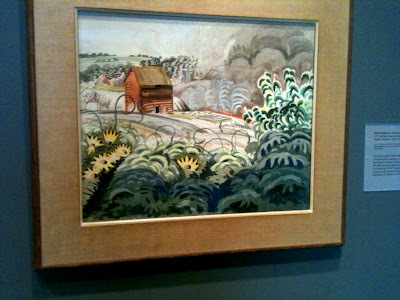 Turns out his mother was a painter, which I'm a sure was a real spur to get him thinking about the art world early on. 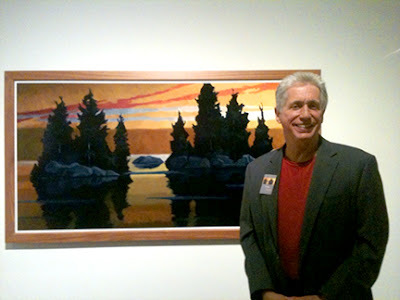 There is some man standing in front of my painting in the exhibit wearing a tag with my name on it. He looks friendly enough. Is Edward Hopper Turing Over in His Grave?